Take time to chill out. Hi Everybody. I’m Tammy Strickland, a 2012 graduated Leaving Cert student in the Institute of Education in Dublin, and more recently a graduate of Human Health & Diseases in Trinity College, Dublin, where I was awarded a Bachelor of Science degree with first class honours. I have created this website, and its sister site www.JuniorCertMindMaps.ie, to share my personal study notes with other students who are facing the Leaving Cert and Junior Cert public examinations in Ireland. The slides above are from photographs I have personally taken on my travels and the captions are little snippets of wisdom I have gleaned along the way. I hope you don’t mind me sharing them with you. I was lucky enough to learn a study technique known as Mind Mapping before starting secondary school and this has allowed me to summarise the entire curriculum in my chosen subjects for both Leaving Cert and Junior Cert in Mind Mapping format. Mind Maps are a terrific way of summarising vast amounts of information in a structured way that aids memorising and recall. They work really well for the vast majority of students as well as being particularly useful for students that have assisted learning needs. It takes quite a lot of time to take my hand-written Mind Maps for my personal use and to turn them into well structured Mind Maps for other students, and this is an ongoing project for me. Right now, I have launched Biology, Chemistry, Business and Geography Mind Maps in Higher Level, Ordinary Level and Teachers Level, and these are available for purchase if you click on the Shop button on the top navigation bar. With College commitments behind me, I am now working on creating additional Leaving Cert subjects. Timing of new releases is difficult to predict for other subjects at this time. However, I am now working full time at content development and I will announce availability of new subjects on this home page as I get close to completion. I can now offer MindMaps in two separate formats instead of just one. Since I started sharing my notes with Junior Cert and Leaving Cert students a few years ago, I have been providing my MindMaps in PDF format. They are designed as an e-Book rather than for printing, although printing is also possible. I am now able to offer them in MindGenius format as well. So what is the difference between the two formats ? Some of the attributes of both versions are highlighted below. Different students will have different preferences and it is really up to them to decide between mobility and flexibility when using either version. The good news is that from 1st July 2017 you will no longer need to choose between versions and you will automatically be provided with both versions for the price of a single version. When I created the MindMaps that I have been selling, I took my hand-drawn MindMaps and transferred the content into electronic format using a tool called MindGenius. I continue to do this today as I add new subjects to those already available. MindGenius is a tool for use on a PC or laptop and therefore it does not have the same multi-platform appeal as the PDF versions of my work. Regrettably, the MindGenius version will not work on a Mac or tablet device. However, MindGenius versions offer a number of advantages to users of my products. Firstly, students can add their own typed notes to my core MindMaps in much the same way that notes can be added to PowerPoint slides. These notes can be printed off. The MindMaps themselves are locked and new branches or modification to branches is not permitted. As with the PDF versions, the student or parent name is locked into every page to protect my copyright. It is possible to open and close branches one at a time in the MindGenius versions so that you can concentrate on a single sub-topic at a time if you choose to do so. This is particularly useful for teachers that are using my MindMaps in class. From a printing perspective, you can print off individual MindMaps in multiple pages across and down so that you don’t need an A3 printer to get large blown-up MindMaps that you can join together and use as wall charts. They may also be printed one branch at a time on A4 paper. Please note that my MindGenius MindMaps have a special MindMap Reader which allows them to be viewed and manipulated. Even if you purchase a full version of MindGenius, the MindMaps will remain locked and the core structure cannot be changed. Nevertheless, you will be able to add your own notes as described above. Because of the popularity of the Website and the huge amount of Mindmaps being sent to people every day, I have automated the system so that your order is processed immediately upon completion of payment through our payment gateway. This means that you should get your download codes, for all purchased Mind Maps, in an automated email from me within minutes of placing your order. If for some strange reason you do not receive your download codes within 15 minutes, it is most likely because your email provider has either placed my email to you in a Junk Mail folder or your firewall settings have stopped the email reaching you. If this happens, check your Junk Mail folder first. Please note that Hotmail in particular tends to dump my emails into your junk mail folder so you may find your MindMap downloads there. 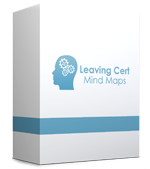 If my email is not in your inbox or junk mail folders, please email me immediately at tammy@leavingcertmindmaps.ie to let me know that you have not received your Mind Maps. Please include a telephone number where I can contact you so I can troubleshoot the problem with you. I promise to resolve any difficulties and get your Mind Maps to you within 24 hours during school term time. As is normal with purchases of all eBooks, we do not accept returns of electronic content (which is impossible) and therefore we do not issue refunds. The MindMaps are my own personal Leaving Cert study notes and they are sold as is. No warranties in relation to the content are offered or implied. I apologise in advance if you find an occasional misspelling or typo. If you are looking for a good printer for printing your PDF version of the MindMaps in A3 or A4 sizes, I recommend Exaktaprint in Dun Laoghaire. The proprietor, Philip Maher, is a friend and he offers special rates for all of my customers. He will print, bind and deliver MindMaps anywhere in Ireland. Philip may be contacted on 01-284 4779 or by email exaktaprint@eircom.net. I do recommend printing PDF’s on A3 rather than A4 paper as the MindMaps are very detailed and the print can be quite small on A4. If you choose the MindGenius versions, it is a simple matter to print them on A4 paper one branch at a time or across and down multiple A4 sheets of paper. MindMaps have become an accepted and trusted method for exam preparation in the last couple of years. MindMaps allow students to study in a structured way that delivers at exam time as well as taking some of the slog out of Leaving Cert preparation. Teachers are starting to recognise the power of MindMaps as a tool for effectively teaching Leaving Cert subjects. In recognition of this, I have created a special set of MindMaps for use in the classroom that will deliver consistently for students and teachers alike.